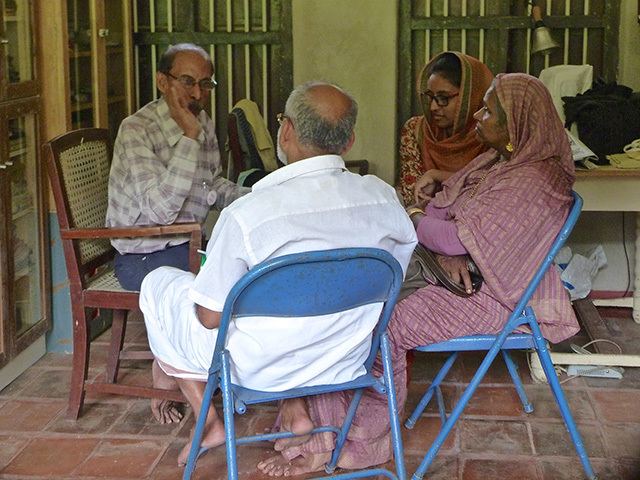 Suresh Babu (Left), former Coordinator of the Indian Secretariat of World Federation for Holistic Medicine and an Advisor to Friends of Tibet's Wellbeing Programme conducts 'Wellbeing Briefing Session' during the 57th Wellbeing Camp at Alappuzha, Kerala. July 2017, Kerala: The 57th Wellbeing Medical Camp organised by Friends of Tibet Foundation for the Wellbeing and Men-Tsee-Khang, Tibetan Medical & Astrological Institute of HH the Dalai Lama was held from July 12-14, 2017 at the Centre for Social & Political Art (CSPA), Sylviander House, Alappuzha, Kerala. The Wellbeing camp re-introduced the 'Briefing Session' on Tibetan Medical System, aimed at educating people on its importance and effectiveness, as a cure for specific diseases, as well as for improving their quality of life. In a conversation Friends of Tibet Campaigner Yazin T Azad had with Suresh Babu, former Coordinator of the Indian Secretariat of World Federation for Holistic Medicine who was in-charge of the Wellbeing Briefing Session, he talks about his understanding of Tibetan Medical System and why it is important to educate people on the same. Excerpts from the conversation are as follows. You know, we are re-introducing 'Wellbeing Briefing Session' after a gap of some time. In this context let us discuss about its relevance for the smooth conduct of our Wellbeing Camps. Whenever I get time I observe our new 'Registrants' coming to the room along with their kith and kin, whom all, I may describe here as 'participants' since they all have to take a conducive role in the holistic healing processes of the Registrant under Tibetan Medicine. Most of them arrive at the wellbeing camp some time earlier than the appointed time as we suggest. A few of them come in a hurry as if signifying that they don't have time to relax before they actually sit for the doctor's investigation or for the briefing session. Generally I find some of these new Registrants entering the room with dejected faces and in a very disintegrated state — physically, mentally, emotionally and spiritually. We know, of course there are few valid reasons behind it. Foremost among it is that they are victims of severe chronic/fatal diseases and must have been subjected earlier to a series of medical treatments and has come to our Wellbeing camp as a last resort or a for a final try of treatment. Further, most of their conditioned beliefs in such medical systems has failed them even after spending long periods in prestigious hospitals and expending huge sums of money, sometimes even pledging their own homes or other valuable assets. There they should have undergone all sorts of treatments based on the clinical/lab/scan tests from time to time and also should have consumed varied combinations of chemical, anti-biotic medicines which all has a disintegrative effect on body and mind resulting in the very low levels of vital energy, sagging spirits and lost hopes of recovery. some of the new Registrants come here with shattered faiths in 'miracle cures' which they hoped to get through some supernatural powers and upon which they had believed, would save them from crisis in their lives. They expect the same to work through Tibetan physicians since they are all Lord Buddha's ardent followers devotedly doing dhyana and other spiritual practices. Some others come to us with high hopes as well as eagerness to know what exactly is this Tibetan Medical System which they might have heard from any of their contact circles or must have seen or witnessed the unbelievable cure, healing and relief experiences of their relations or friends or acquaintances, and has come after being endorsed and recommended by any of them. Such an assortment of participants sitting before us with varied mindsets, expectations, biases, hopes, prejudices etc, need a very soft but authentic handling, both individually and collectively. Therefore, after a short introduction about Tibet's tragedy and Friends of Tibet's committed efforts in supporting them in their struggles for independence and Friends of Tibet's philanthropic, voluntary initiatives like Wellbeing Camps, we brief the participants about Holistic Tibetan Medicine which is really a synthesis of traditional Tibetan medicine, Indian Ayurveda (reached Tibet through Buddhist Monks and physicians) Chinese, Greek and Unani medicine. To preserve their unique heritage and to pursue their commitment to redress the sufferings of their fellow beings in the world as initiated by 'Sree Buddha', their great spiritual head 'His Holiness the XIV Dalai Lama' founded in 1960 at Dharamshala in Himachal Pradesh, their prestigious Medical University Men-Tsee-Khang where annually 25 dedicated students, selected after a tough Entrance Test, undergo a rigorous 5-year medical course to become doctors of repute. These doctors numbering a few hundreds now serve all over India and abroad. This knowledge satisfies fully the participants about Tibetan doctor's meritorious qualifications, expertise and experience. Today Men-Tsee-Khang has become one of the great centres of medical/health scientists and researchers from all over the world, probing the science and practice behind the 'mysterious' Tibetan Medicine known as Sowa Rigpa (Science of Healing). What makes both ancient Indian and Tibetan Buddhist Physicians unique is that they strictly adhered to Holistic Health principles. They had in-depth scientific knowledge about how the body, mind and spirit are crucially interconnected and how to retain as well as to regain integrated (holistic) health and thereby prevent and cure imbalances (diseases) and improve overall quality of human life. They knew well that body, mind and spirit are main interdependent vital aspects of all life forms, especially crucial to that of humans. Consequently disease condition of the body, whether latent or not adversely affects the state of mind and spirit as well. Similarly when the spirit and mind is not in a wellness state, the body too will be badly affected. This progressive atrophy of the physical, mental, emotional, spiritual and intellectual faculties of the human being would result in vicious conditions, beyond one's imagination if it is allowed to deteriorate below certain limits. I am convinced that the 'mysterious' reasons for the unique relief and cure, even in terminal cases (amazing to many) under Tibetan medicine is that it fully recognises this holistic principle that mind, body and spirit play a pivotal, rather a crucial role in diagnosing, understanding, and treatment of the disease as a whole. Pulse diagnosis and other unique and highly revealing investigations resorted by Tibetan doctors goes down in depth to trace and treat imbalances and distortions from the root of the problem itself. Thus Tibetan medical system, with its emphasis on holistic health and on holistic medicine practices like pulse diagnosis, urine analysis, detailed analytical studies on living style, habits, behavioral patterns, herbo-mineral medicines prepared from herbs of blissful Himalayas, etc, provides an invaluable holistic (integrative) wellbeing to its seekers. About Suresh Babu: Formerly Director of Media establishment and Executive coordinator of Indian secretariat of World Federation of Holistic Medicine. Pioneering activist of world renowned nature conservation movements, world environment preservation campaigns etc; Researcher, Author, Editor and publisher of global magazines and books on environment, holistic health, human resource development, scientific heritage, spirituality etc. Holistic scientist and holistic health educationist. Associate of research and management services organizations as research/project consultant. At present engaged in the preparation of a startlingly revealing and informative book "Re-Discovering Kerala". Suresh Babu is an Advisor to Friends of Tibet's Wellbeing Programme.